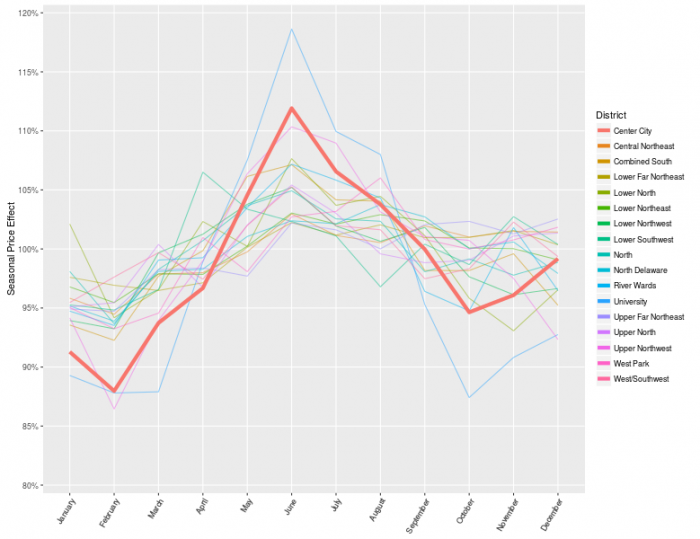 Remodeling Philly's Housing Price Index | Econsult Solutions, Inc. 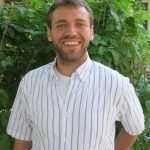 Welcome to the Econsult Solutions Philadelphia Housing Index! Today, we are excited to release the new ESI Philadelphia Housing Index (PHI). Like its predecessor, the new PHI measures changes in the sales price of Philadelphia’s housing units through time, adjusting housing traits to compare like-to-like, with differentiated trends by city district. The model behind the index is a little bit different, however, and allows us to provide monthly estimates, and add some cool new features. We have built an interactive portal to access the data, and will be unveiling new features in this space each month. Like our previous model, the PHI uses deed transfer data from the City’s Philadox website. We clean the data up some, and filter the observations to only arms-length, residential, single-transaction sales. Between January 2001 and July 2016, this gives us 281,677 transactions. The building traits that we control for include square footage, lot size, age, age squared and cubed, the presence of a tax abatement and its age, distance to the central business district (logged and log-squared), fireplaces, garages, central air, stories, building material, whether it’s on the corner, and some technical markers in the deed record. The goal of this is to subtract out features that effect the price besides the neighborhood it’s in. Each neighborhood is allowed to have its own seasonality, specified as neighborhood x month fixed effects; it’s interesting and makes sense to see that University City has the largest seasonal variation in price, hands down. 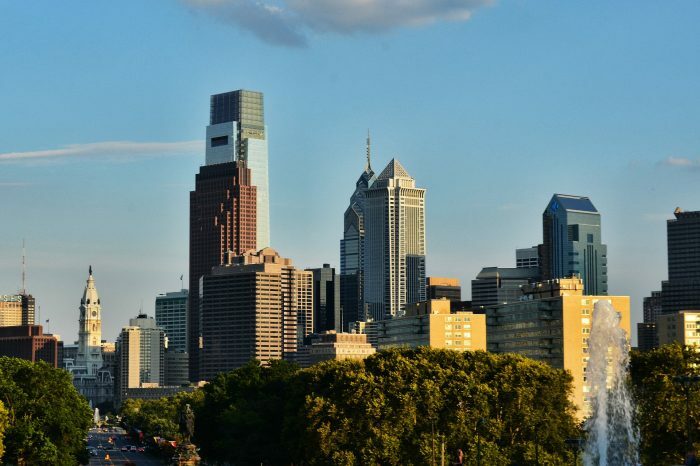 The neighborhood trends represent the price that would be paid in a given neighborhood for a house that had the physical traits of the average house sold in Philadelphia, without seasonal effects. These trends are fit over time using a loess smoother; the daily data can exhibit a lot of noise, the smoother seeks out the signal. We want to be transparent—and hear from you!—so we present the index numbers in the Data tab. 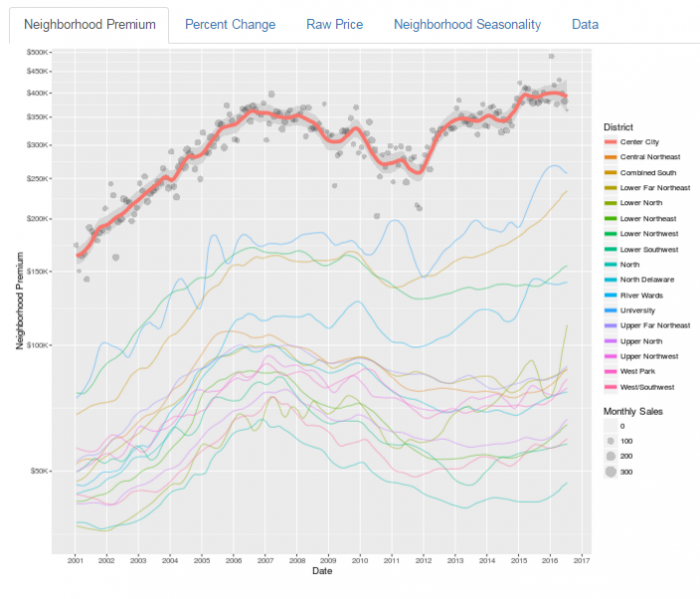 The Adjusted Premium is the neighborhood trend, subtracting building traits and seasonality. The average price is the raw price of houses in the sample; this can be quite different from the adjusted neighborhood premium due to different building traits, seasonal effects, and smoothing over time. We also present the seasonal effects for each neighborhood because, well, we thought they were cool. So what does the PHI tell us? Given that this is the first release of the data, let’s look at some long term trends, and recent trends. It won’t be a surprise to readers that Philadelphia’s neighborhoods vary in their housing prices. Center City buyers pay the highest premiums (even after controlling for how close they are to Center City!). In July 2016, a Center City buyer would pay $405K for a property that cost $260K in University City (the second highest), and $239K in South Philly (the third). Have we reached peak Fishtown? The River Wards (home to Fishtown and Kensingtown), University City, and Combined South (which most Philadelphians would just call “South Philly”) have seen the highest rates of growth since January 2001, with growth of +205%, +244%, and +243%, respectively. Center City, starting much higher in 2001, saw a more modest +140%. All of these are impressive. Over the last year, however, the River Wards, University City, and Center City have remained flat. Each neighborhood showed little to no negligible growth since early 2015. Only South Philly is showing no signs of slowing down. Clicking on a trend line will display the monthly sales prices as points—adjusted for building traits and seasonality—to provide a visual sense of goodness of fit. Some neighborhoods with a lot of sales are very precisely estimated and have stable trend lines (Combined South) while others with fewer sales have large monthly variability around the trend (University City). As more data comes in, our estimates of recent history may change. For example, the August numbers may cause us to adjust the July estimates up or down. Essentially, new data in August will tell us whether a jump in July was a real shift in conditions or just random noise, and our historic trends will adjust accordingly. This is a work in progress, and we are going to be adding new features, running new analyses, and telling new stories in the months to come. Have an idea for a feature? An interesting question? Notice something cool in the data? Let us know via email or social media using the hashtag #PHLhousingindex. Take a look a our Philadelphia Housing Index. Philadelphia Housing Index: The El’s Impact on Neighborhood Premium Cheers to Beers! Breaking Down the Concept of Economic Impact with a Beer (or two) Could Center City Homes be Driving Millennials Out?